Low Oil and Gas Prices Boost the Chemicals Industry - Plunkett Research, Ltd. The dramatic recent declines in the price of crude oil and natural gas have reduced costs for much of the chemicals industry. In many cases, these reduced costs have been passed on to end users. The global chemicals industry will total about $5.3 trillion in revenues in 2018, according to Plunkett Research estimates. In the U.S., chemicals will generate about $901 billion in revenues during 2018. U.S. plastics and rubber industry revenues were $232.5 billion in 2017, according to the Bureau of the Census. Chemicals and plastics companies are taking advantage of abundant natural gas in the United States. As a result, the future looks extremely bright for American chemicals makers. The continuing flow of natural gas from shale formations is the driving factor here, since gas is a primary need of the chemicals sector. Additional significant factors are the relatively low cost of electricity in many parts of America, and reasonable wage costs. Compared to much of the rest of the world, gas and electricity are superb bargains in the U.S.
America’s chemicals sector manufacturers are gaining considerable advantage from the extremely low price of natural gas, an advantage that is likely to last for many years. The immense surge in shale gas and shale oil production is leading to a boom in chemicals plant construction on the Gulf Coast of America, close to major gas fields. As of mid-2018, The American Chemistry Council reported 325 new U.S. petrochemical projects in the works, largely due to the massive output of America’s shale gas fields. The Council estimates the new activity will add $337 billion to the U.S. economy and 467,000 direct and indirect jobs by 2025. U.S. exports of chemicals will soar. In particular, the manufacture of ethylene-based plastics is a major benefactor of today’s boom in low-priced natural gas from shale formations. Makers of oil-based chemicals (propylene polymers) are likewise getting relief from the low level of U.S. oil prices, and strong production from oil fields such as the Eagle Ford in Texas. 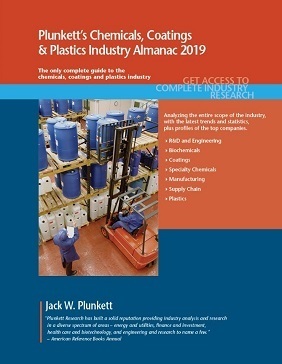 Plunkett’s Chemicals, Coatings & Plastincs Industry Almanac, 2019 edition.